One more year, Beltá & Frajumar has been present in this event. 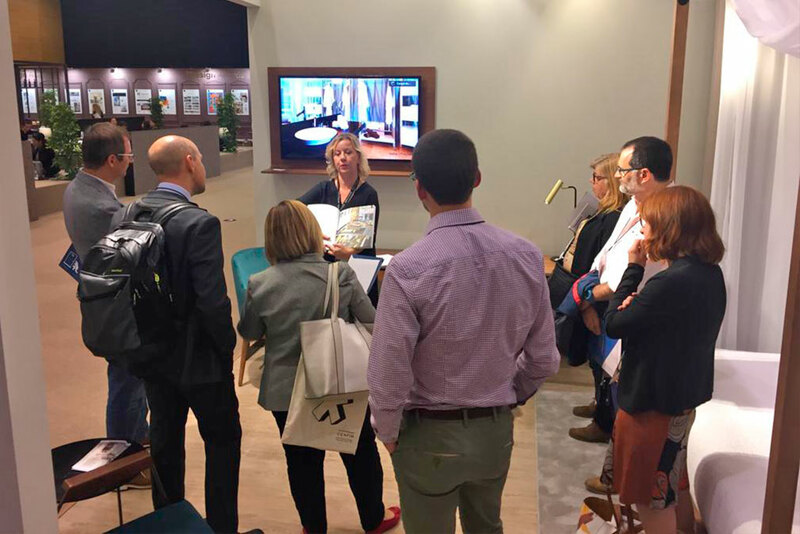 A marketplace which is a reference for hospitality furniture, taking place in Barcelona, InteriHotel. Along three days, hotel companies and hospitality sector professionals visit this event. 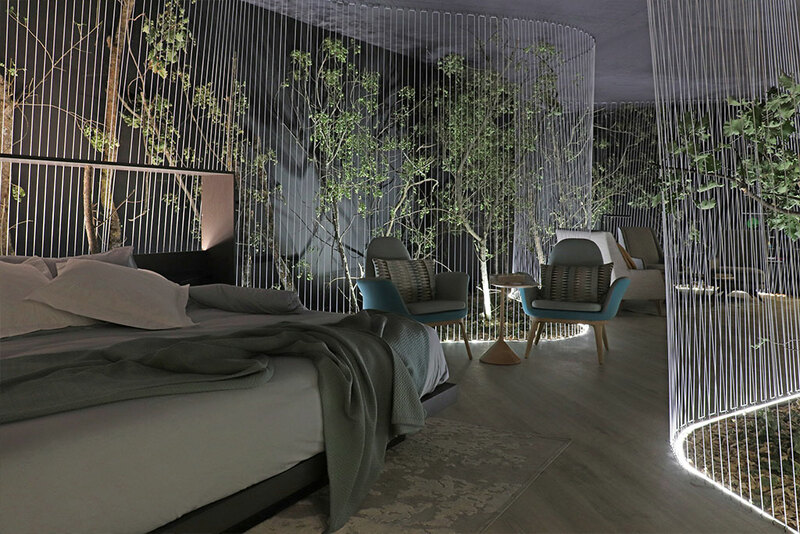 Beltá & Frajumar has been making reality the winner bedroom of InterCIDEC of the last year on the professional category. Adapting it for this occasion and designed by Jesús Torné. This project of a bedroom is characterized to be a bed with a canopy and in the back, to have a wardrobe. It has an elegant and timeless style, on which highlights the noble materials used like wood and marble. A design that, despite being of generous dimensions, inspires lightness thanks to the use of glass cloths that bring transparency to the whole. In the rest of the bedroom, highlights the upholstered wall very characteristic of the project, giving warmth to the whole, combined in wood. 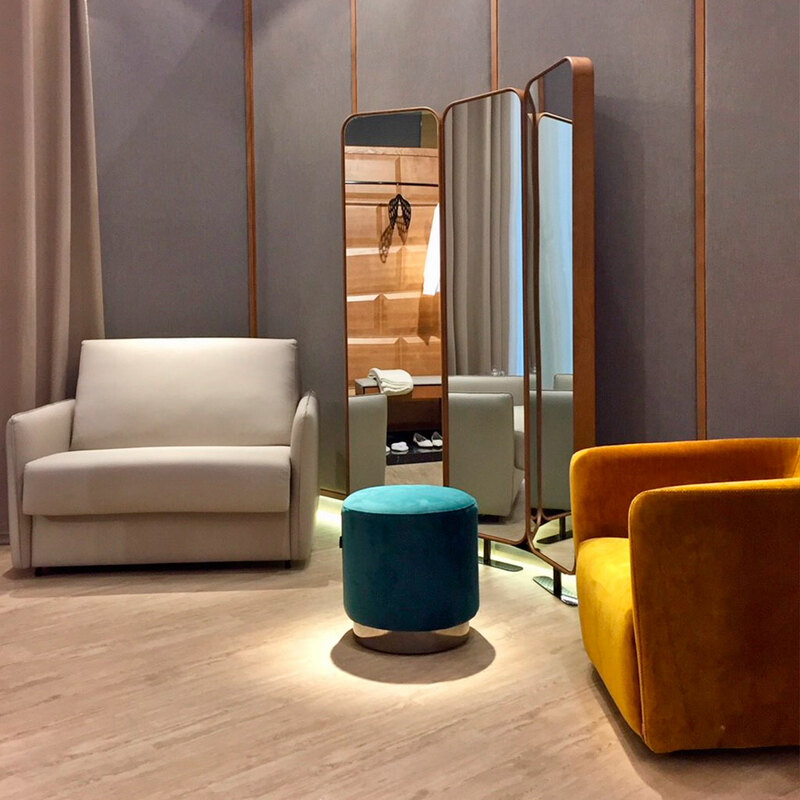 Above this upholstered panels, the mirror that is composed of three sheets, a tribute to the classic boutiques, where the user is the protagonist. The whole thing is coming coupled with upholstered elements, like a pouff or the Ecko armchair, both on velvet. In the back part of the bedroom, it highlights a desk of 2.5 meters long, generous dimensions, in wood and metal, with two chair models: Lema and Even. With wraparound shapes in which highlights the care details of wood and the green upholstered velvet, the protagonist colour of the whole. Accompanying the group, the Tamo armchair and the Domo table by the designer Vicente Gallega, which, Despite being very recent pieces from our collection, has immediately become the protagonists of our projects. Making use again of the same materials; velvet, metal finished in black nickel and marble of the same colour. In conclusion, space where the eclectic, elegant, modernist and timeless styles are the main protagonists. 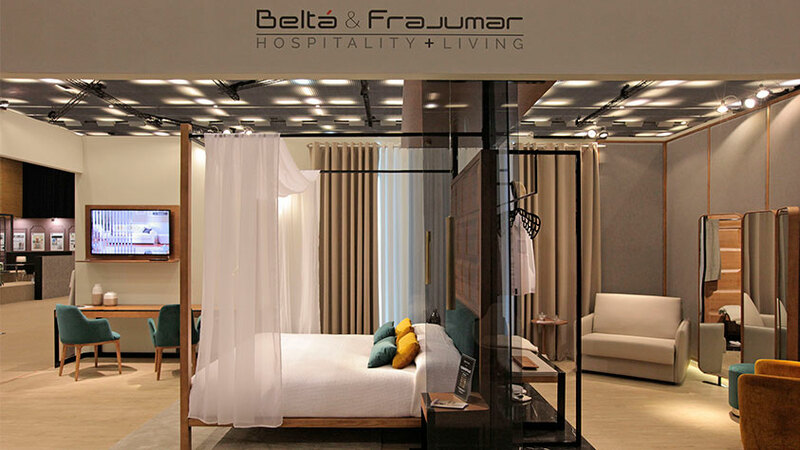 In addition to the stand, Belta & Frajumar have been in some spaces of the premises. For example, the brand has collaborated with the CODIC (Interior designers and decorators school of Catalonia), which has been responsible for the Lounge area interior design. An area placed next to the reception at the entrance, so the visitors could relax and enjoy the environment. In the Lounge area, there were armchairs, tables, and sofás from the Belta & Frajumar catalogue. Highlighting the Play and Marc collections by the designer Jorge Pensi. Lily and Rund by Designio Studio. Tempo and Look by Vicente Gallega. Pao by Lluís Codina or Delta by Javier Herrero, among other pieces. Space where we can appreciate the know-how of the interior designers when they want to use such diverse elements like these. Interior designers from CODIC. Other of the spaces in which have collaborated Belta & Frajumar, has been the Interior Designers area 1, designed by Morph Architecture Studio. This Space has been a surprise because of its breaking proposal, making a very different environment where the visitor could dive into a different experience from the rest of the event. In such space, we have added furniture such like the Even and Blom armchair, and the Fres and Rund tables. As we can see in the picture, they were perfectly integrated into the interior design made for the occasion. 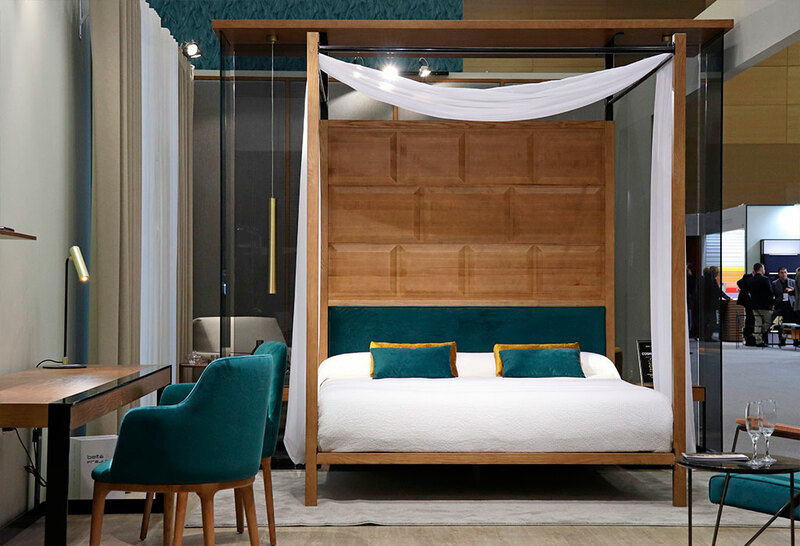 As well as the walking areas, Belta & Frajumar has given pieces for InteriHotel, like the Luka collection by Jorge Pensi, Ideal furniture for high resistance of usage in common areas, bid modularity and giving a lot of solutions. Coupled with other pieces such the Punk armchair, Igno table or Opof pouff by Dario Gagliardini. We can’t forget that the first day of the event, Wednesday 24th, took place one of the most important days for InterCIDEC, the awards ceremony, organized by Belta & Frajumar and giving the finishing touch to this third edition, and presenting the fourth. Whether you want to know the winners, here you have all the information. In conclusion, we invite you to tell us your opinion about InteriHotel and your impression of it. What did you like the most and what would you improve. We await your comments! Thank you.